Of course there must be books recommended by this librarian-storyteller. 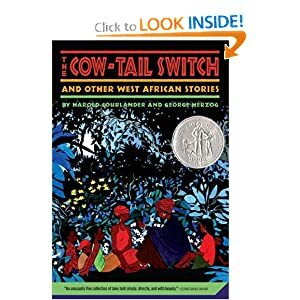 The 1947 Newbery honor medal winning The Cow-Tail Switch by Harold Courlander and George Herzog was republished by Square Fish. I treasure several stories in this collection of west African tales and it still deserves a place in folktale collections. The cover story specifically fits this series as it illustrates staying alive because someone is remembered. I'll not say more, hoping you read it or hear me tell it some time. Finally I've discovered Lynn Rubright's excellent book after fellow storyteller, FranStallings, recommended it on the Storytell list. I'd heard of the book before and wonder why I hadn't read it. The oral history chapter describes a project with upper elementary students and seniors living in their area. The project helped the kids discover an exciting part of their area's history. Additional cross-generational projects in the book also are documented for sharing the arts and folklore as excellent opportunities for elders to bond with children and preserve their experiences. In Lynn's bibliography I found my absolute favorite book for Oral History, Telling Your Own Stories, by storyteller, Donald Davis. I had only the time while my mother was in the hospital to use it with her, but I'm so glad I did and only wished I had discovered it earlier. The memory prompts in it also work for writers of fiction or to remember stories from your own life. Alessi, Jean, and Jan Miller. 1987. Once upon a Memory: Your Family Tales and Treasures. White Hall, VA: Better Publications, Inc.
Daniel, Lois. 1985. How to Write Your Own Life Story: A Step by Step Guide for the Non-Professional Writer. Chicago: Chicago Review Press. Rosenbluth, Vera. 1990. Keeping Family Stories Alive: A Creative Guide to Tapping Your Family and Love. Point Roberts, WA: Hartley & Marks, Inc.
Welty, Eudora. 1984. One Writer's Beginnings. Cambridge, MA: Harvard University Press. Zeitlin, Steven J., Amy J. Kotkin, and Holly Cutting Baker. 1982. Celebration of American Family Folklore: Tales and Traditions from the Smithsonian Collection. New York: Pantheon Books. Zimmerman, William. 1982. How to Tape Instant Oral Biographies. New York: Guarionex Press, Ltd. There are certainly other books, but Lynn gives an excellent start. Thank you, Lynn, Renee, Judy, and all my storyteller friends. I hope this helps you and others you may interview Stay Alive with Oral History.